You have to be some kind of gearhead to write an entry about your new wheels, but here I go. After some issues with the inexpensive wheels I had put on the Tarmac, I decided to go all out and ordered a set of top-of-the-line Shimano Dura-Ace WH-7801-SL wheels. 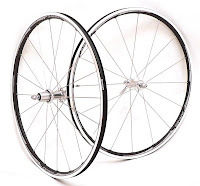 There was a good report on Cyclingnews.com which I only discovered after buying the wheelset. I chose it for the reasonably light weight--1600 g--although I did not realize it uses weird proprietary stainless steel spokes. Mr. Informed Shopper also did not realize that it is the only wheelset compatible with the new Hutchinson Fusion 2 tubeless tires. These would appear to be quite revolutionary. They work much like a car tire, fitting snugly against the rim and not requiring a tube. These are not to be confused with tubular tires, which are more or less just like inner tubes without an outer casing. The tubeless tire weighs the same as a traditional tire and tube, so you don't save any weight. The difference is that the tire is only inflated to 95 psi so there is excellent road contact and enhanced cornering capability as the rubber along the sides is stiffer. Rolling resistance is claimed to be no different and of course there is no way to get a pinch flat since there is no tube. Hutchinson, which is, in spite of the name, a French company explains this all in amusing English on its website. When the wheels came I looked at the instructions and carefully inserted the valves, which fit onto the rim. Then I applied a bit of soapy water and was able to get the tire to sit against the bead of the rim fairly well, but I had to use a tire lever for the last little bit. The instructions warn that using a tire lever except the special Hutchinson one will result in damage but the Crank Brothers SpeedLever works very smoothly and I had the tire mounted in a moment. Pumping it up--you really need a floor pump for this-- takes a bit of effort and it seemed to me a lot of air was leaking out of the sides as I began to work but suddenly the tire bead popped into place and voila! air in the tires. I left them overnight to see what would happen and they were fine, so on Saturday I went to Rock Creek Park and rode 62 km as a test. The Shimano wheels are pretty stiff and very responsive. Best of all, unlike the old wheels they made no creaking sounds and the cassette body was not binding. Hooray! The Tarmac rides now in total silence, as it was meant to. The tires are fabulous--silky smooth and with amazing cornering grip. Compared to the 140 psi I was used to in my Vredesteins they seem pretty comfortable as well. I have ordered some sealant and once that is in the tire I apparently do not need to worry about flats unless the tire is actually cut. It is then possible to put a tube in it to get home. You can even ride on the rim if you have to, but considering what these things cost I do not find that to be an appetizing prospect. If these things work as advertised, I think we are looking at the future of cycling. Look, Ma--I'm finally an Early Adopter!